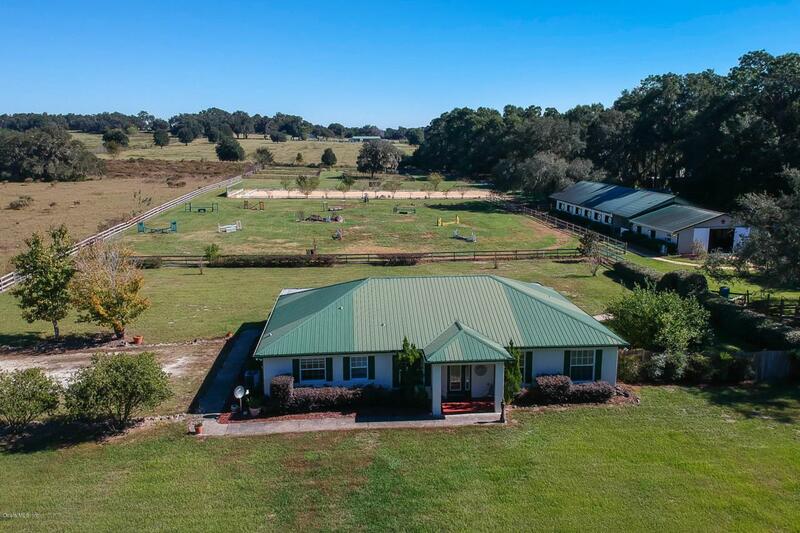 This amenity-filled 12+ acre Ocala horse farm is move-in ready. It contains 3 barns for a total of 19 stalls: Barn 1 has 4 12x12 stalls, automatic waterers, ceiling fans, flood lights and small hay shed nearby. Barn 2 contains 5 12x12 stalls, tack room, sliding barn doors, fly spray, automatic waterers, ceiling fans, stall pads and flood lights; and connecting Barn 3 has 10 stalls, 14 foot center aisle, front and rear sliding doors, fly spray system, auto waterers, and stall pads. It also includes 3 wash racks w/hot and cold water, patio, bath/laundry, office, and storage. The adorable 1 BR/1 BA 700 sq ft apartment contains full kitchen, screened porch, and fenced yard. Great for seasonal rental. This farm also contains a USEF regulation irrigated dressage ring with 66'x8' mirrorsand well maintained footing; there's also a large jump field. The well-crafted main home features arched entries, office, master with 2 walk in closets, en suite bath with double vanity, whirlpool spa and walk in shower; there's also a lovely screened patio. This farm needs nothing but you and your horses to make it complete.